Around 6 weeks ago I got a new PC at work, running Windows Vista and Office 2007. I must say that I'm impressed by both. After the initial shock of the new UI, you soon begin to unlock the power of new software. Visual Studio seems to get on great with Vista too, which is a huge bonus. One great thing they have done in Vista's IIS offering, unlike previous Workstation IIS offerings (XP, 2000 Pro), is to allow you to set up more than one website. This capability was previously for Server operating systems only. Anyway, this afternoon I faced the task of setting up a website that ran in ASP, with some Virtual Directories, and an ASP.Net Web Application that ran in another Virtual Directory on the same website. At first glance this seemed easy. 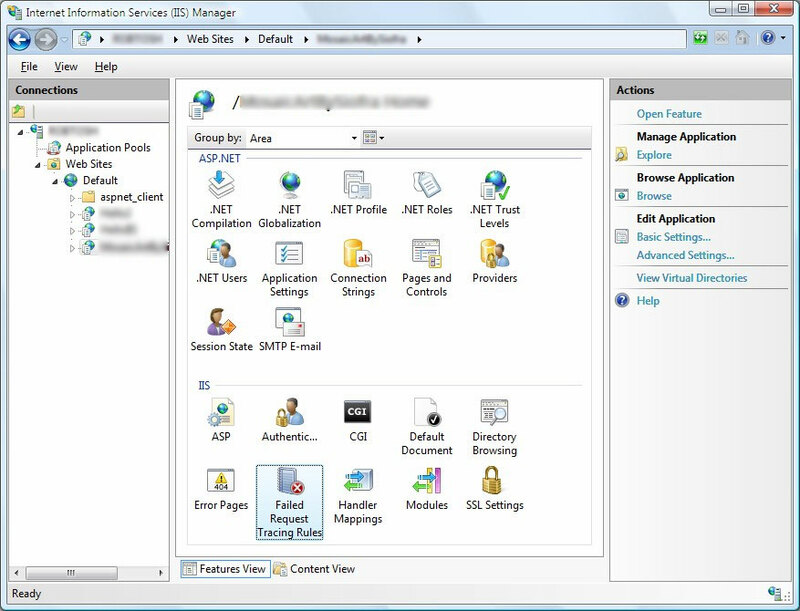 Open IIS 7, and you will see your sites the left, and all of the settings icons in the main window pane. Right click under websites and select "Add a website". Specify "Physical path", "Port", "Host header", and you're well on your way. Next, add any Virtual Directories. These are simple enough to do, simply specify your "Alias" and "Physical Path" for each. My first error rasied its head here, the default documents we're not set to those of my site. Always remember to add any non-standard default documents i.e. myhome.asp when deploying a website. Once corrected, I pressed F5 in my browser again to get the default error message passed back. "An error occurred on the server when processing the URL. Please contact the system administrator"
Here you will need to enable IIS to show the actual error message. Click the ASP Tab in IIS. Set "Send Errors To Browser" to "True". Initially I wondered whether Microsoft had been stupid enough to disable relative paths i.e. "../../folder" as a security measure. No need to panic though, they're simply disabled by default. Simply return to the ASP settings and set "Enable Parent Paths" to "True". Of course, you could always use "Include Virtual" instead of "Include File" to prevent this error. Thats it for the ASP, all should be up and running now! Now for the ASP.Net area of the website. Initially I made the mistake of adding a further Virtual Directory for the web application, however, this is incorrect. Instead, when you right click on your website properties, select "Add Application". Specify "Alias", "Physical Path" and "Application Pool" (or leave on DefaultAppPool). That's it, IIS 7.0 should now be delivering to localhost, or your specified Host Header on your specified Port. There are many new and improved features in IIS 7.0, which I look forward to using in the future. Some of you may also be interested in IIS 7.0's integrated FAST CGI support for PHP! If you would like to ask any questions about IIS 7, please Contact Me. Read more about web hosting at my dedicated web hosting section of this website.